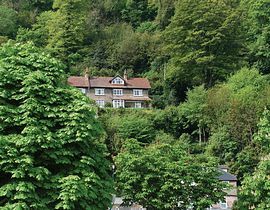 Bay View House is a delightful late Victorian house with truly stunning panaramic views of the sea and harbour of Lynmouth, we have private parking for guests cars. Lynton & Lynmouth are known as Englands little Switzerland and you can enjoy many lovely walks from our own doorstep, maybe a walk along the river to Watersmeet, or the coastal path to Valley Of Rocks, perhaps you may like a ride on the famous water powered cliff rail way from Lynmouth to Lynton. 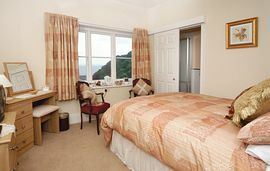 Bay View House has 3 very well equipped en-suite bedrooms, decorated and furnished to a high standard, all rooms have flat screen freeview digital TV, CD music centres, tea and coffee trays and many thoughtful little extras, and of course a stunning view from each room. We are totally non smoking, although we are not licensed you are welcome to bring your own drink or wine, which we will chill, and provide glasses if necessary. Our food is our speciality at Bay View. Proprietor Mark has over 20 years professional cooking experience, and we cook everything fresh on the day from local ingredients as much as possible. We look forward to welcoming you soon to this beautiful peaceful corner of North Devon. 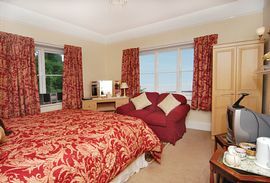 Bed and Breakfast: From £31.00 to £39.00 per person/night. Dinner 3 courses and coffee: £17.50 per person/night. We have special offer breaks available throughout the year, please see our website for further special break offers. On Entering Lynmouth travel up the hill towards Lynton, Take the 2nd turning on the right hand side about half way up the hill, turning into Clooneavin Path, which is a very sharp turning, you may find it easier to go up to Lynton and turn around and come back down Lynmouth hill into Clooneavin Path, we are located towards the end of the road where you will find our private car park.